What is Mortal in the Soul? / Ruhların Ölebilen Kısmı Nedir? Bizans döneminde din adamları cemaatlerine ölülerin hayattayken işledikleri günahlar için cezalandırıldığını ama durumlarının adlarına yapılan dualar ve sadakatlerle iyileştirilebileceğini söylerdi. Ne var ki herkes buna ikna olmadı. Bazıları söz konusu faaliyetlerin üzerine temellendiği kavramsal çerçeveyi reddediyordu. Onlar bedensiz ruhlarının ne kendilerini bilebildiklerini ne acı ya da sevinç duyabildiklerini iddia ediyorlardı. Altıncı yüzyılda ilk defa ortaya çıkmış olan bu alternatif görüş on birinci yüzyılda tekrar boy gösterdi. Bu çalışma o ikinci münakaşayla alâkalı iki başlıca kaynak, Niketas Stethatos'un Ruh Hakkında adlı eseri ve İoannes İtalos'un 50. Opusculum'u üzerinde durmaktadır. A.D. Angelou, Nicholas of Methone. Refutation of Proclus' Elements of Theology, Athens, 1984. M. Angold, Church and Society in Byzantium under the Comneni (1081-1261), Cambridge, 1995. R. Aubert, 'Jean, évêque de Scythopolis, dit Jean le Scolastique (première moitié du VIe siècle', Dictionnaire d'Histoire et de Géographie Ecclésiastiques 27 (2000), pp. 617-619. N. Constas, 'An apology for the cult of saints in late antiquity. Eustratius presbyter of Constantinople “On the state of the souls after death”'(CPG 7522),' Journal of Early Christian Studies 10 (2002), 267-285. M. Dal Santo, Debating the Saints' Cult in the Age of Gregory the Great, Oxford 2012. P. van Deun, Eustratii Presbyteri Constantinopolitani De statu animarum post mortem (CPG 7522), Turnhout 2006. G. Dagron, 'L’ombre d’un doute: L’hagiographie en question, VIe-XIe siècle', Dumbarton Oaks Papers 46 (1992), 59-68. J. Darrouzès, Nicétas Stéthatos. Opuscules et lettres, Paris 1961. E. R. Dodds, Proclus. The Elements of Theology, Oxford 1963. B. Fragineau-Julien, Le sens spirituels et la vision de Dieu selon Syméon le nouveau théologien, Paris 1985. J. Gouillard, 'Léthargie des âmes et culte des saints: un plaidoyer inédit de Jean diacre et maïstôr', Travaux et Mémoires 8 (1981), 171-186. J. Gouillard, 'Le procès officiel de Jean l’Italien. Les actes et leurs sous-entendus', Travaux et Mémoires 9 (1985), 133-174. M. Hayduck, Ioannis Philoponi in Aristotelis De Anima libros commentaria, Berlin 1897. M. Hinterberger, 'Ein Editor und sein Autor: Niketas Stethatos und Symeon Neos Theologos', in P. Odorico (ed. ), La face caché de la littérature Byzantine. Le texte en tant que message immédiat. Actes du colloque international, Paris, 5-6-7 juin 2008 (Paris, 2012), 247-264. P. Joannou, Joannis Itali Quaestiones quodlibetales (Studia patristica et Byzantina 4, Ettal, 1956). A. Kambylis, Symeon Neos Theologos, Hymnen, Berlin and New York 1976. D. Krausmüller, ‘Hiding in Plain Sight: Heterodox Trinitarian Speculation in the Writings of Niketas Stethatos’, Scrinium 9 (2013), 255-284. D. Krausmüller, '"At the resurrection we will not recognise one another": radical devaluation of social relations in the lost model of Anastasius’ and Pseudo-Athanasius’ Questions and Answers', Byzantion 83 (2013), 207-227. D. Krausmüller, 'Establishing Authority in the Constantinopolitan Religious Discourse of the Eleventh Century: Inspiration and Learning in the Writings of the Monk Niketas Stethatos', in S. Steckel, N. Gaul, and M. Grünbart (ed. ), Networks of Learning: Perspectives on Scholars in Byzantine East and Latin West, c.1000–1200 (Berlin–Münster, 2014), 107–24. D. Krausmüller, 'Contextualising Constantine V’s radical religious policies: the debate about the intercession of the saints and the ‘sleep of the soul’ in the Chalcedonian and Nestorian churches', Byzantine and Modern Greek Studies 39 (2015), 25-49. D. Krausmüller, 'Christian Platonism and the Debate about Afterlife: John of Scythopolis and Maximus the Confessor on the Inactivity of the Disembodied Soul', forthcoming in Scrinium 11 (2015). A. Munitiz and M. Richard, Anastasii Sinaitae Questiones et Responsiones, Turnhout 2006. J. C. T. Otto, Corpus apologetarum Christianorum saeculi secundi, V, Jena 1881. Y. Papadoyannakis, 'Defining Orthodoxy in Pseudo-Justin's Quaestiones et Responsiones ad Orthodoxos', in H. Zellentin, E. Iricinschki (ed. ), Heresy and Identity in Late Antiquity (Tübingen, 2008), 115-127. E. Rebillard, The Care of the Dead in Late Antiquity, Ithaca, London 2009. E. Stéphanou, 'Jean Italos: L'immortalité de l'âme et la résurrection', Échos d'Orient 32 (1933), 413-428. ISNAD KRAUSMÜLLER, Dirk . "What is Mortal in the Soul? / Ruhların Ölebilen Kısmı Nedir?". 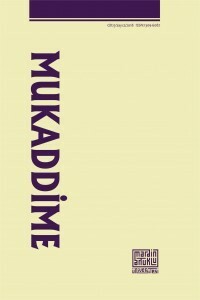 MUKADDİME 6 / 1 (September 2015): 1-17.